The all-aluminum Orbea Rallon stood out from our 20-plus bike test fleet for a number of reasons. 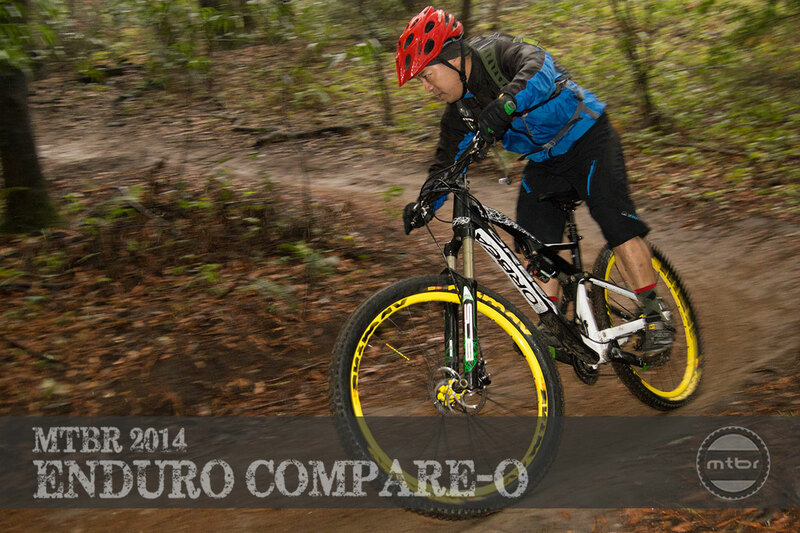 First, it was one of the few all-aluminum bikes in the test. Second, it had a unique BOS front and rear suspension system specially designed for the Rallon. And third, its curb appeal was undeniable. Once we swung our legs over the Rallon, we noticed that the frame has quite a long top tube. Orbea confirmed that sizing runs on the large size, with a couple 6-foot-tall riders fitting perfectly on the medium size frame. Climbing up Sulphur Springs fire road, riders seemed satisfied with the way the Rallon ascended. The steep 74.5-degree seat tube angle puts the rider in a forward pedal-friendly position good for technical climbing. Another rider had a few issues with pedal strikes through more technical climbing sections due to its rather low 13.3-inch bottom bracket height. Pedal strikes were also a slight issue on downhill sections as well, forcing riders to be mindful of crank angle and pedaling through corners, especially with the rear suspension compressed. It should also be noted that the test bike only had 170mm long cranks, which would make pedal strikes with 175mm cranks even more common. The Orbea Rallon was created specifically to rule the Enduro World Series circuit, and unlike most bikes that design suspension around suspension leverage rate, the Rallon Advanced Dynamics suspension was designed alongside BOS to control 160mm of rear travel through shock tuning. 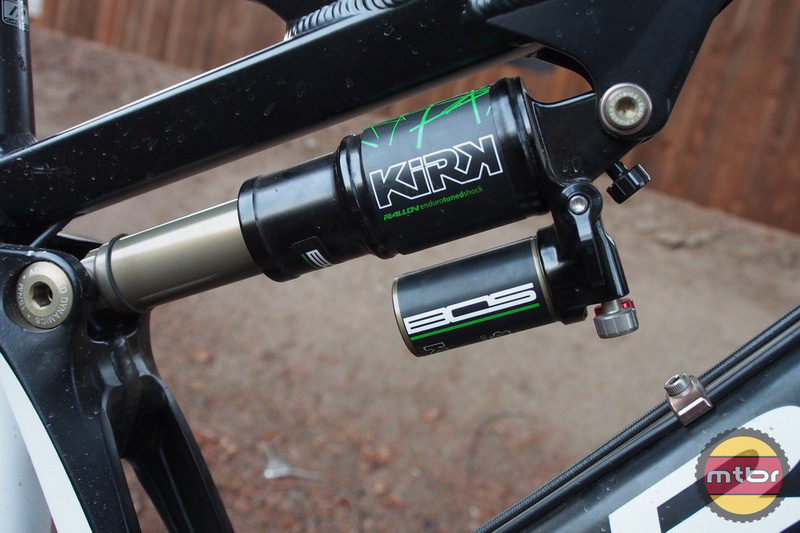 This gives the BOS Kirk rear shock much more influence on the feel of how the Rallon descends. With separate rebound, high- and low-speed compression settings, the BOS Kirk shock is incredibly tunable, which might be intimidating for some who just prefer a set-and-forget mentality. For those, the Rallon can be equipped with the FOX Float CTD shock. With the BOS Kirk shock matched to the 160mm BOS Deville front fork, it gave the Rallon one of the most balanced feels of any bike in the test. With a minor turn of the eccentric shock mount hardware, the Rallon can adjust bottom bracket height up to 7mm and angles by a half-degree depending on terrain. A concentric pivot at the rear 12×142 axle makes for a super stiff overall chassis as well as stronger and quieter braking. All of these innovations help the Rallon absolutely shred when gravity calls. Once pointed downhill, the Rallon displayed as much attitude in action as it does at rest, with one rider singing its rowdy praises. With its unique suspension design and 160mm of travel, the Rallon soaked up brake bumps and rough sections of trail with the smoothness of a 29er. In sections where other 27.5-inch bikes like the Ibis Mojo HDR had difficulty staying composed, the Rallon charged through without hesitation. Another unique aspect of the Rallon is its purposefully mismatched front and rear wheel/tire combo. 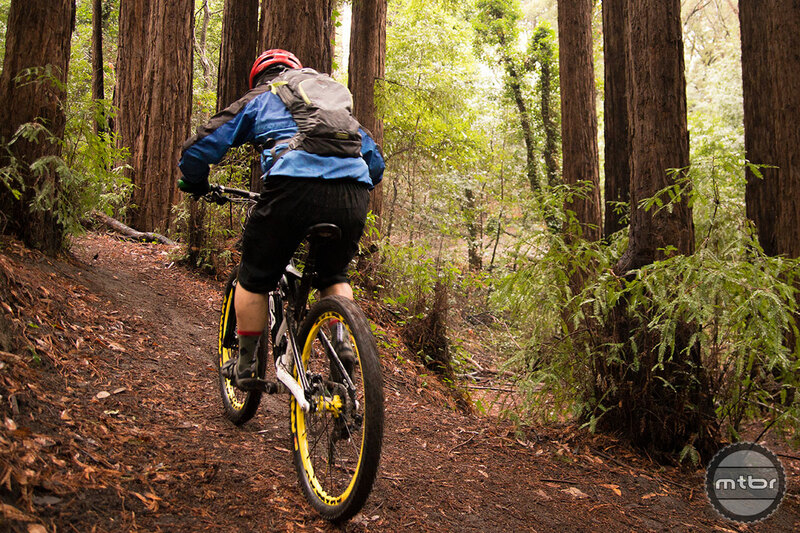 The Mavic Crossmax Enduro wheelset features a wider front rim and blocky Mavic Charge 2.4-inch tire paired to a narrower rear rim and a lower-profile Mavic Roam XL 2.2-inch tire. This intentionally unorthodox combination made the Rallon oversteer into corners, encouraging riders to slide it through turns. 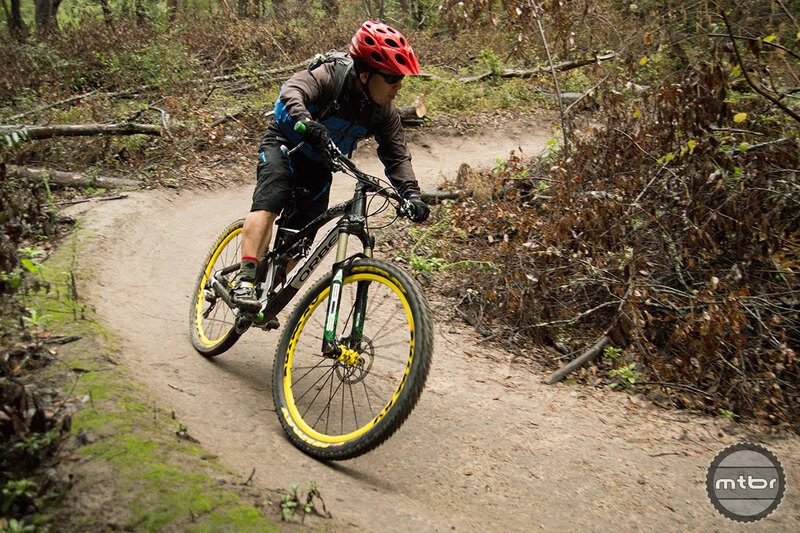 Its exceptionally short 16.5-inch chainstays—the shortest of any bike in our test—helped the Rallon turn with superior eagerness and agility. Are those the same formula brakes you guys trashed in the GT Sensor review? Why such different impressions. In the “bad” list you forgot to mention it’s $7000… for an aluminum framed bike! That’s a tough pill to swallow. This is one of the few times I think you can safely say: Someone has to pay for the extensive R&D. Plus it comes in 4 levels if your are more budget minded, and don’t mind riding Fox and XT. Have to agree with Daniel’s FB comment. This bike’s performance boils down to its fork and shock. Take those away and what do you have left? It’d be interesting to know how the Fox-equipped Rallons perform. I demoed this bike today and was completely blown away. It laid to waste every bike I have demoed over the last six months. It smokes down hill and technical rides like nothing else while still being able to claw up climbs. I am now seriously considering purchasing this frame. Regarding Daniel’s comment above, I thought the suspension felt great, but I don’t think that was all that was happening. The Rallon has a unique geometry (long top tube, short chainstays, steep seat angle, slack head angle and really low bb height) that is just that notch above than other similar bikes. Plus, I like the feel of the DB Air even better (weight diff of 4.5 ounces…BFD), which is what I will run on it paired with a Pike SA 160.